Banadashtami dedicated to Goddess Banashankari - When is Banadashtami in 2020? There is also a Banashankari Navratri in Pushya month and is observed by devotees of Banashankari. Fairs and festivals are held during this period in Banashankari temples. Banadashtami is observed on the eight day after new moon in the month of Pushya. The day also marks the beginning of festivals dedicated to Goddess Banashankari. 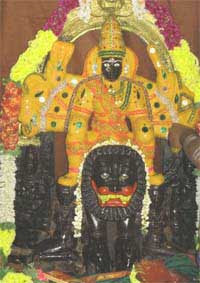 A major fair is held at Badami Banashankari Devi Temple during this period and it begins on Banadashtami day. According to Skanda Purana, Goddess Banashankari Devi killed a demon called Durgamasur at the present day Badami in Bagalkot in Karnataka. Banashankari Devi was also said to be worshiped by mighty Chalukyas as their Kuladevi. Famous temples dedicated to Goddess Banashankari are located in Badami and Bangalore in Karnataka. Banashankari Navratri - Banashankari Navratri is nine-day festival, puja and rituals dedicated to Goddess Banashankari in the Kannada month of Paush in Karnataka.